A walk through my thoughts & experiences here. Being hands-on is a necessity to the success of your bird house. Merciless power of Mother Nature! Just as I begin to draft topics on Thermal Basics, including Water properties (a preamble to Humidity discussions). Our world seem to be going through unusual times. I can't recall any part of my life calamities on such scale occurred within a short span of time. The Japanese search and rescue team was rushing back from Christchurch to a much larger disaster on home turf. 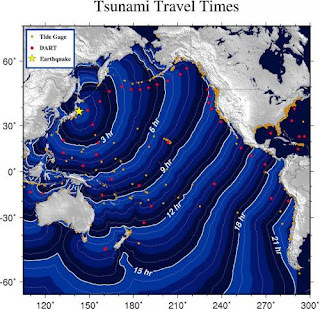 From super storm Yasi (2nd Feb, Australia), earth quake devastating Christchurch (NZ) and now 8.9 Richter scale quake off Japan triggering Tsunamis across the Pacific Ocean like waves rippling across a swimming pool. Across Californian coast, a man lost his life, swept off by waves out on photo taking! 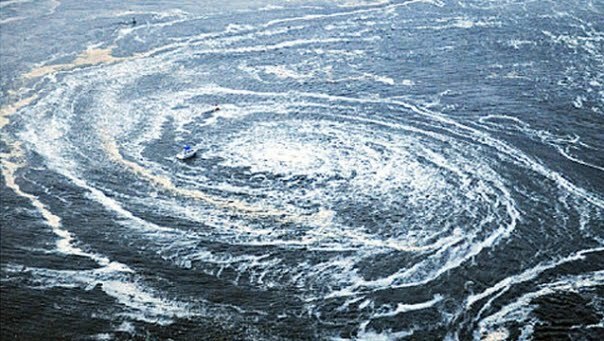 Huge ocean whirlpool, the boat caught in there was totally helpless! Water so essential to support life as we know in every form, when charged with enormous energy can release such destructive power! For all we know, "know how" and technology, humans are completely at its mercy! Whether air or water, can carry enormous amount of energy. The wavefront of the Tsunami, 10m high & tens of km long, reportedly at 800 km/hr. What! Compare to airliners cruising at subsonic speed under 1,000 km/hr., that's 80%.How much energy is out there! A cubic meter of water weighs one ton. Tsunami that hit land with velocity reportedly at 60km/hr. The classical mechanics formula of kinetic energy E = 1/2 (mass x velocity^2). Wow.. it's the square of velocity that tells how much "mind-boggling" energy Tsunamis carry. 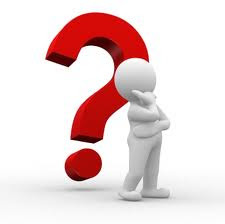 A learned friend once posed me a question: "What's pervasive throughout the universe?" Its no other than "ENERGY". How did Albert Einstein's came out with his genius formula e = mc^2 that relates energy to mass? It literally states the same. A few billions years down the road, our Milky Way galaxy now on collision path with a much bigger one will come to head. Our galaxy will be torn apart, swallow up wholesale with the "Black Hole" at center of both galaxies merge to form a even bigger galaxy. That's power of Mother Nature at much higher order. All life forms on earth will be extinct before that event occurs. Our very own sun is burning itself out too. With less mass, hence reducing gravity holding its gaseous mass as time passes on, it will swell to engulf the nearest planets including our mother Earth. Again, life forms will extinct before that occurs. This is no science fiction, the odds are stacking up. Our existence is merely transient. The universe will carry on without us as passengers. It won't happen anytime soon. Even then folks, "live the moments" while it last! A value to foster among members. "Hi... As you will come to know some members are very experienced. Think we all can assist you to improve your BH. Here can be a case of true spirit of "Farmers help Farmers". If you agree I will feature as a case study. I suggest you create a 3-D model with SketchUp from Google. It is free. We use this software to share design ideas, so you might as well pick it up and model your BH as an exercise. I'll approach the solution to your humidity problem with a scientific explanation behind. My intent is to uplift everyone's knowledge at basic level." Case 2: Tweetybird initiated a topic to retest the accepted norm of BH temperature. Tweetybird: We need everyone to report on the daily and seasonal temperatures of their ranches and the results & observations relating to those conditions. Charles: Good suggestion for group participation. A case of synergy through group learning. A member expressed to me the goals of Open Learning Network as ambitious. Idealistic perhaps, frankly I never think that way.. Sometimes, we have to be Idealistic. Values are Ideals, aren't they? If we foster the right attitude and spirits, we are on the way. Time will prove it right or wrong. 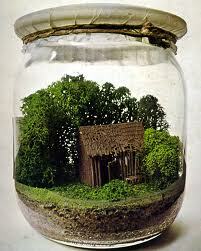 There's life in the "bottle". 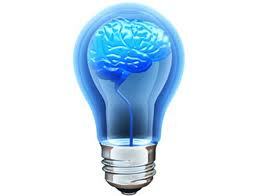 The "Open Learning Network" to me is also like an experiment in a "bottle". I begin to see signs of life, just need to keep nourishing it. Interacting with a few early starters, the concept put to test is gaining traction. It hasn't produce synergy of any significance yet. No doubt it will come with time. The open exchange of opinion & experience with some is just like meeting of the minds. While others seek opinion/assistance in one way or other. So far 2 BH designs were privately shared & reviewed. One is under construction while the other is kicking off. Another member consults for his humidity set-up. Behind doors, technical discussions kicked off dealing with electrical hazards in BH and re-examine established norms of micro-environment. This is encouraging. Similar to a Forex network, "Traders help Traders"... we are into "Farmers help Farmers". Membership will be capped as of end March, 2011 for the time being. I feel next phase is to settle-in, knowing each other better and work on a clearer road map in the process. Preamble to what's in store. The idea of a Swiftlet Farmers Handbook was mooted more than a year ago. I procrastinated over it on and off wondering if it is worthwhile. What the hack, does it matter? "Just do it".. and let time prove its worth! 4. Choosing tweeters: cost vs. performance - Fit for use criteria? I don't compare with the new BH Design book costing US$200+, its value no doubt will exceeds that many times. Can we do away with the roving room? What is your take, learned friends out there? I leave this as open topic to all.. take your time to think it over! 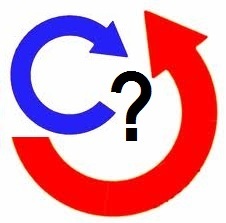 Question of Clockwise vs Anti-clockwise? This is a classic example of "Truth, 1/2 truth, myth & misleading ideas" all confounded and floating out there. It is also a case of established "knowledge" can be challenged. Does a swiftlet colony fly in one direction only (Clockwise or CC)? Read in a book by famous guy in the industry that it is so. - My observation from the successful farm told me it couldn't be so as my main entrance to 2nd (floor) is counter clockwise, and staircase to lower floor is clockwise. And lower floor is densely populated. However, I don't know if they might have a dominant/preferred direction." First he saw a contradiction to his observations. The conflict raises a doubt, so what is true? I don't subscribe the CW or CC theory too. Come in CW also means going out CC isn't it? Just that when the bird come in one direction it continue circle in same direction, rather to made abrupt change, which they are well capable of too. Your example is precise enough, didn't cross my mind earlier. In my limited readings, there is no claim a colony fly in one direction only (I take as in general flights). So this statement can be "misleading". Or as Eugene says some consultants preach one direction only. How true is that? Can be just as misleading. There are implications in books (though not explicitly) some birds are CC and CW. Does it also imply birds are either one or other, just like us human - left handed and right handed? When you see illustration in books drawing circles CC and CW all over, looks impressive but there is little content actually. The author need to pad it up, doesn't he? When such "information" (won't refer as knowledge) floats and regurgitate by many over and over .. perpetuates a myth eventually. Then through perception as reality. So what is 1/2 truth? Yes, we see birds flying both in CC and CW direction in the roving/nesting rooms continuously. Then what is the truth? "if you see how swiftlets maneuver along the small lanes during the evening, they're better than any jet plane pilots around"
These birds are amazing flying creatures! Have you watch them making "about-turn" in mid air along a narrow passage? They are unafraid of large predator birds in the sky.. knowing they can out maneuver them. So does the idea of CW & CC hold as Eugene states.. out there they fly in all directions with ease! 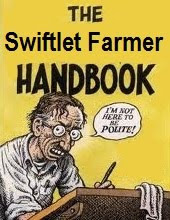 Why are they call swiftlets in the first place? In open sky while gliding, turning is simple movement in shifting wings elevation and body weight. So is there a left-wing/right wing tendency? I doubt so, correct me if I am wrong. When birds fly into tighter space such as roving room, max. speed is to circle around the boundary (like us taking corners on the roads, right?) Or one can explain with Newton's laws of motion & momentum. Where is the need to reverse suddenly unless threatened? A same bird may well come in CC and next time CW while exploring the BH. Once they are settled, they are 'programmed' with the fastest route in/out, dependent on nesting location. So logically from this perspective, a colony would take the same path in/out. CC or CW can be a random mix among the population from different nesting spots. Did you see juveniles doing "figure 8" in the BH? Above are my take to elaborate.. of course, there can still be "Truths, 1/2 truths, myths and misleading ideas" embedded within! I begin to feel an "Open Learning Network" can actually work. What have I learned in this exercise? Pick a topic from a member and bring into focus - one at a time. Agree? A question was posed to me the other day. Answer being sought in consideration of the above to the internal layout of BH. I have given opinion in response. To readers out there, anybody care to comment? Let's see if this is a good test case of group synergy.